The Vikings were walking proof that you didn't need to have an ornate or overly complex helmet to keep your head safe and protected. This 14 Gauge Steel Viking Helmet is a modern-day reproduction of the same helm that Viking warriors would have favored, and it is made to such quality that it provides all the protection that a warrior might need for their head. Based on the nasal helm design, this iconic helmet consists of a single piece of forged 14 gauge steel with a center ridge that protects the cranium from adverse blows. A rivet-reinforced strip of metal acts as the rim of the helmet, while a flared nasal guard extends down in the front and provides a measure of protection to the warriors face. An adjustable inner liner, made of leather, is attached to the interior of the helmet for a more comfortable wear. 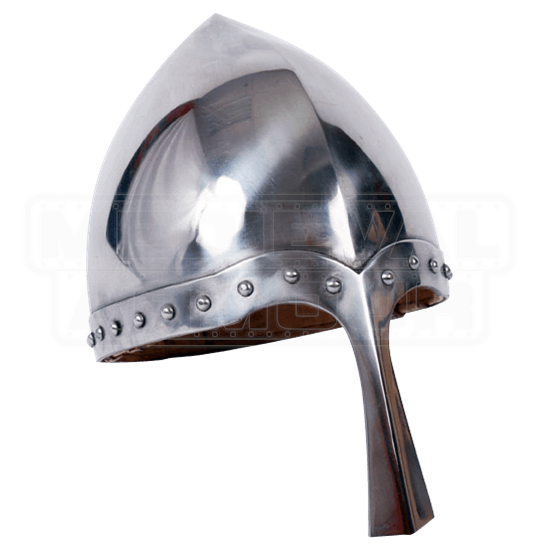 Skillfully crafted from thick steel, the 14 Gauge Steel Viking Helmet is quite durable, and thus makes an impressive defense that will keep the heads of warriors safe when it comes to costuming and reenactment of all sorts.